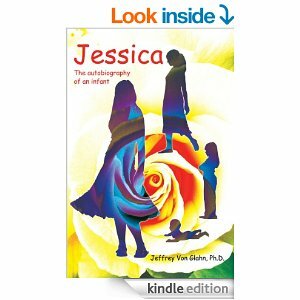 I am pleased today to host a blog tour stop for Dr. Jeffrey Von Glahn’s fascinating book, JESSICA: The Autobiography of an Infant. ​Jessica had always been haunted by the fear that the unthinkable had happened when she had been “made-up.” For as far back as she could remember, she had no sense of a Self. Her mother thought of her as the “perfect infant” because “she never wanted anything and she never needed anything.” As a child, just thinking of saying “I need” or “I want” left her feeling like an empty shell and that her mind was about to spin out of control. Terrified of who––or what––she was, she lived in constant dread over being found guilty of impersonating a human being. Jeffrey Von Glahn, Ph.D., an experienced therapist with an unshakable belief in the healing powers of the human spirit, and Jessica blaze a trail into this unexplored territory. As if she has, in fact, become an infant again, Jessica remembers in extraordinary detail events from the earliest days of her life––events that threatened to twist her embryonic humanness from its natural course of development. Her recollections are like listening to an infant who could talk describe every psychologically dramatic moment of its life as it was happening. When Dr. Von Glahn met Jessica, she was 23. Everyone regarded her as a responsible, caring person – except that she never drove and she stayed at her mother’s when her husband worked nights. ​In this excerpt, I had been seeing Jessica for over a year. I was still struggling with getting her to be more open about herself. I knew I had to do something about Jessica’s continuing guardedness about herself. I had a foolish urge to ask Jessica herself about this, but, fortunately, the notion flew out of my mind as fast as it had entered….I finally developed what I thought was a rather creative idea. Little did I know that…I would make an unexpected discovery: for all these months, I had been laboring under a delusion about who was sitting across from me; and, in fact, I had been deluded from the moment Jessica first stepped into my office…. I sprang this question on her without any warning, for a very specific reason. I hoped it would force her to react on the spot, before her defenses had had a chance to get organized. I was tired of listening to bland reports of incidents that had already happened, after her psyche had transformed them into emotionally sterile recollections…. Even though I had never before asked her anything even remotely similar, she replied immediately. It was as if she had been expecting my question from the very start of therapy and had been steeling herself for it ever since. “You’re just a computer,” she quickly began. She sounded like a professor who was impatiently explaining a fundamental point to an obtuse student. “You’re just a thing I put information into and get a program back. You can’t be human. You can’t have any feelings.” Then her words stopped as abruptly as they had started. She stared blankly at me. When Jessica looked at me, did she see that I was a human being? Of course she did. Yet, that reality wasn’t enough for her to overcome her fear about relating to me as a human being. Why she wasn’t able to do that was beyond my comprehension. I just couldn’t understand how she could see me as something other than human, after I’d spent months of unrelenting effort trying to reach her. Her chilling answer was one I might have expected from a robot, not from someone who functioned in society, talked face-to-face to me, and, aside from her inability to stay home alone at night and her fear of driving, behaved like an ordinary person. I had never felt so estranged from another human being in my life. Thank you, Jeffrey and 4Wills Publishing, for such an insightful and important work. This entry was posted in Uncategorized and tagged 4Wills Publishing, Autobiography, blog, blog tour, childhood, counseling, Dr. Jeffrey Von Glahn, Faith, healing, hope, infant, Jessica, nonfiction, psychology, self-esteem, The Autobiography of an Infant, therapy, trauma, Writing, youth by Lisa Kirazian. Bookmark the permalink. Jeffrey, great post! We’re enjoying this tour and Iwould encourage everyone to stop and pick up a copy of this book, then let’s discuss. Lisa, you already know you’re awesome! Thanks for the hosting of our Client! This is a very intriguing excerpt, Dr. Von Glahn – such a fascinating study! I wish you every success with your book! Thanks for hosting, Lisa! Thank you. I appreciate it very much. P.S., I prefer “Jeffrey.”. Enjoy your tour. 4WillsPublishing does an wonderful job. Thank you Lisa for hosting. Thank you. My apologies for a tardy response. Thank you so much, Harmony, for your comment. I appreciate it very much..